Below article from Weather Underground. Forecast temperature departures from average for March 20, 2019. The areas most above-average are shown in the brightest pink and white contours. The all-time March record highs set in Alaska on March 18 and/or 19, 2019. 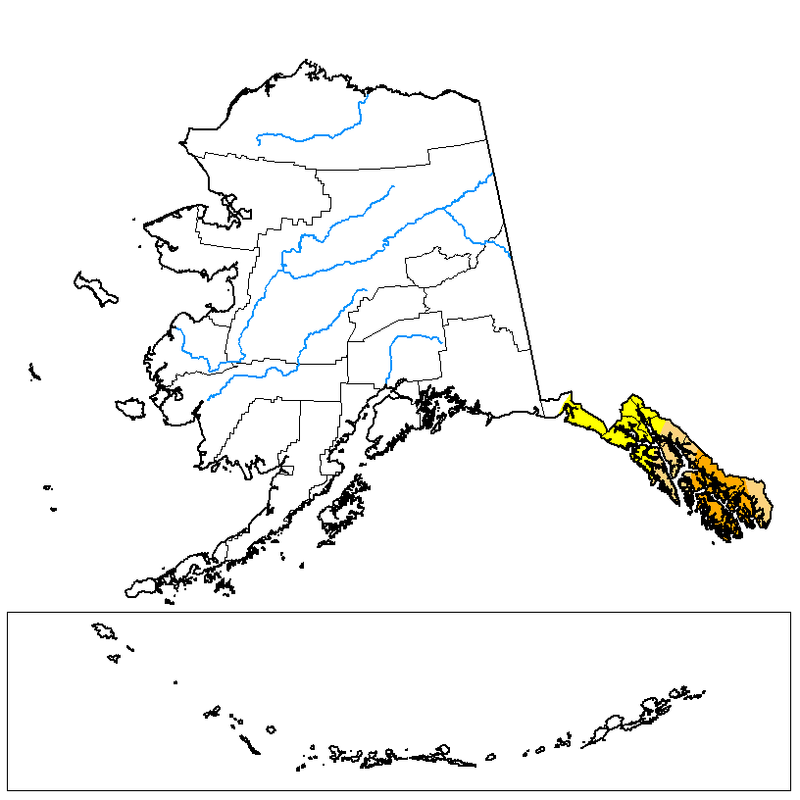 Five other Alaska locations did tie or set new all-time March warmth records this week. Sitka topped their previous March record with a high Monday of 62 degrees, then shattered it Tuesday soaring to 67 degrees. Their average high this time of year is only 43 degrees. Annette tied their all-time March record, set just one year ago, both Monday and Tuesday, reaching 65 degrees. Other March records were set in Eagle (55 degrees), Petersburg (63 degrees) and Yakutat (60 degrees). Average highs this time of year in the town of Eagle, in Alaska’s interior near the Canadian border, are only in the low to mid-20s. The warmth extended into western and northern Canada in places you’d usually expect to be ice- or snow-covered in late March. Yohin Lake, less than 400 miles from the Arctic Circle in the Northwest Territories, soared to 21.8 degrees Celsius (about 71 degrees Fahrenheit) Tuesday, the first time on record a location in the Northwest Territories warmed to at least 20 degrees Celsius. Neither Denver, nor Kansas City, had yet to reach 70 degrees in 2019. This was just one of 10 locations in northwest Canada smashing new March records, according to Patrick Duplessis, a doctoral candidate at Dalhousie University in Halifax, Nova Scotia. Duplessis mapped monthly records set Sunday, Monday and again Tuesday. The town of Norman Wells, also in the Northwest Territories, crushed its previous March record on three straight days. Farther south, Tofino, British Columbia, also crushed a March record Tuesday, soaring to 24.5 degrees Celsius (about 76 degrees Fahrenheit). Weather Network digital meteorologist Tyler Hamilton illustrated what an outlier this warmth on Vancouver Island was. It appeared this would have also set an April all-time high, there. This warm spell took a toll on the snowpack, as this before/after photo from Edmonton, Alberta, illustrated nicely. After shivering through February, this warm spell is also rewriting the record books in parts of Washington state. Seattle soared to 79 degrees Tuesday, not only an all-time March high in records since 1894, but also for any day in the five-month stretch from November through March, according to the National Weather Service. If that wasn’t impressive, Seattle also set its record warmest daily low temperature not just for March, but also April, barely dipping below 60 degrees Tuesday. Quillayute, Washington, soared to 81 degrees Tuesday, also a March record, and 13 days earlier than their previous record earliest-in-year 80-degree high (April 1, 1987). This was 30 degrees above their average high near the spring equinox. Typically rainy Quillayute – near the western tip of the Olympic Peninsula – reached 81 degrees this year ahead of both Atlanta and Dallas-Ft. Worth, which had only hit 80 degrees so far, both in February. Just down the coast, Hoquiam, Washington, also set an all-time March record, soaring to 79 degrees Tuesday. While not monthly records, highs also soared into the mid-upper 70s in Oregon’s Willamette Valley, including Eugene, which had its third warmest March day on record Monday (77 degrees). The reason for this warmth can be traced to a Greek letter. Namely, blocking high pressure aloft centered over western Canada has diverted the jet stream into a shape resembling the Greek letter omega, pumping warm air north into eastern Alaska. Sinking air associated with the high-pressure dome warms as it sinks, dries out the air and inhibits cloud cover. Furthermore, easterly winds moving down the slopes of the Cascades and Olympic Mountains of Washington state give an added boost to surface temperatures. This is quite a stark change in the Pacific Northwest. In early-mid February, Seattle picked up just over 20 inches of snow during one of its snowiest months on record. Eugene, Oregon, picked up a whopping 18.8 inches of snow from Feb. 24 to 27, downing trees and power lines. Interestingly, southeast Alaska, typically one of America’s wettest locations, continues in moderate to severe drought as of March 12.